Having the chance to visit the Piaggio Aerospace display area at the last Farnborough International Air Show, even allows one to discover the genesis of a cult, the design work behind it, and the legacy of a style that - having moved across different industrial sectors since the end of the 19th century - can be admired today on board aircraft such as those used for private transport, for example. This market segment is called Business and General Aviation (BGA) and includes small aircraft that accommodate a number of passengers ranging from 7 to a maximum of 20. This niche market, however, might cease to be defined as such in the coming years, and might become more and more accessible. Although perhaps it may never be as popular as the most famous scooter in the world. The logical link, in fact, is completely immediate, for Italians as probably for many other people in the world: Piaggio means Vespa. 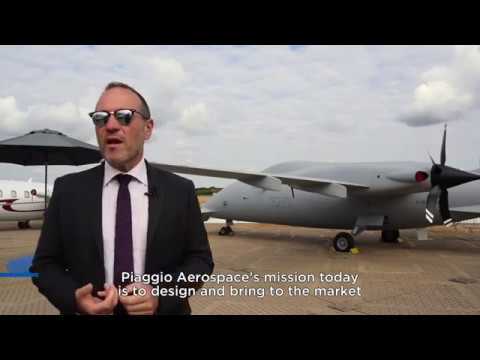 Piaggio Aerospace is the Italian company which is mainly active in the BGA sector; its historical heritage includes the legendary P108 (the last large four-engined aircraft built in Italy), P148 and P149 aircraft. At present, its new flagship aircraft are, respectively, for private aviation and for the defense and security sector: the P180 Avanti Evo and the P.1HH HammerHead. Renato Vaghi, CEO of Piaggio Aerospace with an excellent career in the aeronautical industry, highlights that 2018 marks the company's centenary in aeronautical activities. “The company was founded in 1884 by Rinaldo Piaggio, but aeronautical activities officially began in 1918”. Indeed, since prior to tackling the aeronautical sector, Mr. Piaggio’s ingenious entrepreneurship originally had moved from naval furnishings to railway construction, after which, starting from Pisa airport, its success story in aviation began. This was at a time when the Italian aeronautics industry was presenting itself to the world with names such as Aermacchi, for example, or with Avio Aero itself (Fiat Aviazione, at the time). The legendary Italian scooter was the first product of Piaggio's industrial conversion, and was characterized by aeronautical engineering and materials. In fact, Enrico Piaggio wanted an easy, light and agile means of transport, on which one could sit as if in an armchair and which was comfortable for a woman. It took the genius of an aeronautical engineer, Corradino D'Ascanio, to deliver the first Vespa to the world in April 1946. The commercial rise of the legend begin only two years later, achieving the production of one million scooters by 1956. “D'Ascanio was an exceptional inventor” says Vaghi, “as a high school student he even tested a home-made hang-glider, he was in love with aviation and in particular with helicopters (in 1930 he won the world flight endurance record for helicopters, ed. ), but he did not like motorcycles, so with the Vespa he built a unique and revolutionary motorcycle for those times. He enriched it with aeronautical elements that gave it strength and lightness: an aluminum alloy frame, an engine related to the aircraft starters of the time and even wheels resembling those of airplane trolleys”. Aeronautical and motorcycle activities became independent after the Vespa boom. Today, Piaggio Aerospace is a company with almost 1,200 employees, its headquarters and main factory are in Villanova d'Albenga (Savona, Noth-West of Italy), while it owns other maintenance and overhaul centers for aircraft engines (inside the Italian airports of Genoa, Pratica di Mare and Ciampino), and sales offices in Miami, Florida. In addition to building aircraft, it offers assistance not only on the turboprop engines that characterize Piaggio aircraft, but also on jet engines. The two models P180 Avanti Evo and P.1HH HammerHead combine the original “Made in Italy” style with high technological content: from aerodynamics with three load-bearing surfaces (in addition to the wings and the stabilizers in the tail, the Avanti Evo features ailerons in the aircraft nose that improve stability even more), to the five-propeller engines. The Avanti Evo, whose interior looks like a luxurious limousine with comfortable seats and finishes typical of Italian elegance, resembles a jet thanks to these original engines, whose propellers are facing the tail. “It is an extremely fast aircraft, it feels like traveling on a jet whilst enjoying the efficiency of a turboprop engine, as operating costs are reduced by 30%. It can cover a maximum distance of almost 3,200 km, climbing over 12 thousand meters while cruising and reaching a speed of up to 745 km. On the other hand, the P.1HH HammerHead was designed and built on the commercial platform of Avanti Evo, thus inheriting its benefits: reliability, safety and unique performance for a military aircraft, considering that the HammerHead is the fastest in the UAV (Unmanned Aerial Vehicles) segment”, says Vaghi. In the Defense sector, P.1HH HammerHead is an extremely interesting, as well as highly innovative, aircraft: it was created as an Unmanned Aerial System for patrol and surveillance missions. It is an ATOL (Automatic Take Off and Landing) aircraft and is positioned in the high-end of the MALE (Medium Altitude Long Endurance) class of unmanned aerial vehicles: it has an above-average load capacity, can reach an altitude of 13,700 meters and has a flight range of over 16 hours. These two aircraft are placed on the market with their unique characteristics and performance, and in this regard Renato Vaghi confirms that “the engine is the most valuable equipment on board an aircraft, particularly with regard to UAVs”. Especially in view of the future growth trend of the BGA segment: “Cooperation with engine manufacturers will be of fundamental importance, even more so in the next 10 years. Indeed, the sector is growing, becoming less elitist and more accessible to new groups of users, not least as a result of congestion in commercial air traffic. That's why it is desirable to work with engine manufacturers to minimize direct operating costs”. Airplanes featuring a “jet like” experience call for efficient new turboprop engines characterized by digital technologies and lightweight materials: there are excellent conditions for the Italian aeronautical sector to reopen a new season of splendor, for aircraft and even engines. And guess what: 2018 is Avio Aero 110 anniversary too.